This is probably one of my best baking triumphs – it came out well on the first try, did not require fancy ingredients, and took minimal time. 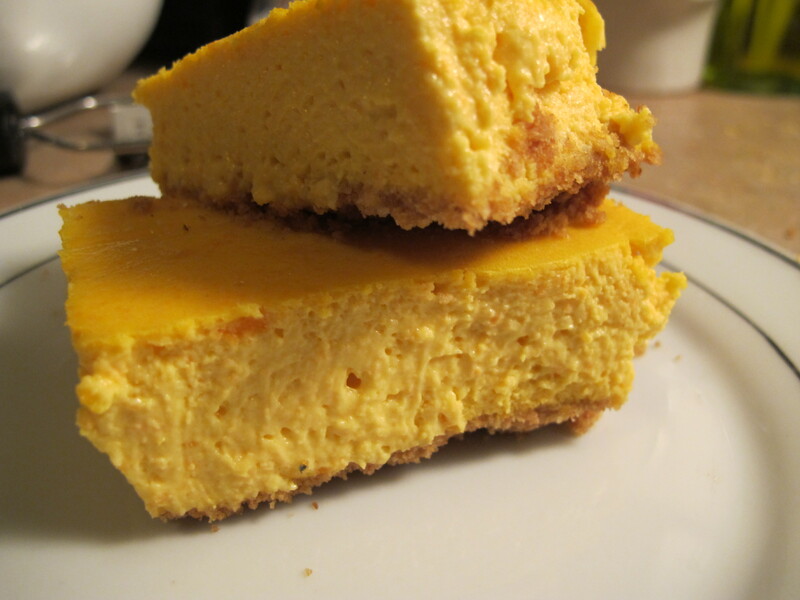 The orange juice wakes up the creaminess of the squash, and together they make the cheesecake taste a bit lighter than normal. I included the cost to make this dessert just in case anyone invested in the baking pantry staples. The whole thing is under $12.50 to make, which is at least on par with, if not cheaper than, buying a grocery store sheet cake for a crowd. Though, I don’t have anything against grocery store sheet cake. Everyone needs a little sugary icing in their life. Pulse crackers in food processor until they are crumbs, add 1/2 stick of melted butter. Pat into bottom of greased pan, bake at 350 for 12 minutes, set aside to cool. Blend together cream cheese, eggs, sugar, orange juice and zest. Add sweet potatoes, 2 tbsp butter, and vanilla, blend on high until smooth. Pour into crust. Bake at 350 for 30 minutes or until middle is slightly jiggly. Voila. Total: $12.30. This assumes you already have vanilla, sugar, and butter- my pantry staples.